THE MOST BEAUTIFUL WORDS THESE HANDS HAVE EVER WRITTEN: THE END | Nam Writes. That’s my excited scream, in case you couldn’t tell. It is demonstrably distinct from my petrified scream, which hopefully I’ll never have cause to use on this blog. So why am I screaming like a crazy person? 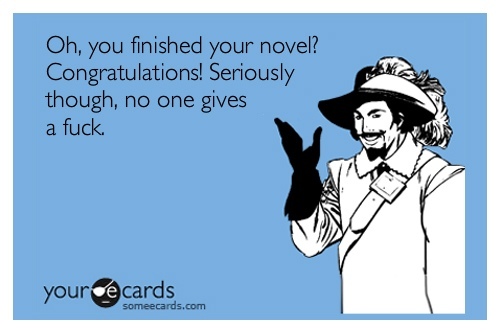 Brcause I have finished the first draft of my novel. Before you get carried away, let me stipulate: It is just a first draft. There are some parts I like, but there are a lot of parts that make me think, why in the world did I think writing a book was a good idea? Basically, there’s still a long road ahead of edititng, rewriting, hurling myself at a wall and rewriting some more. But for the first time in my life I have written a book that has a beginning, a middle, and an end.